We use this cream at the clinic – it’s effective, utilizing only natural ingredients. Please ask at reception if you would like to try some (we have little sample packs), or purchase direct from the clinic at discounted rates. 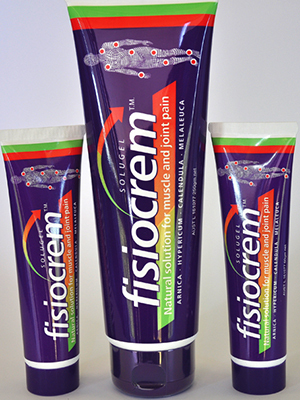 Fisiocrem is an effective, all natural massage cream to care for the muscles and ligaments following injury related to daily activity or intense physical exercise, and for temporary relief of muscular aches and pains. Modern science brings many new insights into active plant ingredients, their components and activities. Arnica is probably one of the best-known herbs worldwide for its use in natural medicine. It has become famous for its role in Homeopathic medicine where the dilution of the plant is used orally as a first aid treatment for shock, trauma and body injury. Arnica pure herb extracts, when applied topically are extremely effective in treating soft tissue injuries and especially for recovery from bruising. Commonly known as “St John’s Wort”, the oily extracts are bright red in colour from the active components, hypericin and hyperforin. St John’s Wort has a long history for its use in soothing damaged and irritated nerves commonly found in whiplash, low back pain, sciatica, strains and sprains. Plays an important role as a topical anti-inflammatory, assisting the dispersion of swelling, and providing a calming relief for angry localised tissues. Australian Tea Tree oil, is well known for its analgesic, anti-inflammatory and anti-microbial effects. It is commonly used and very effective in topical applications.